An Arpeggiator! 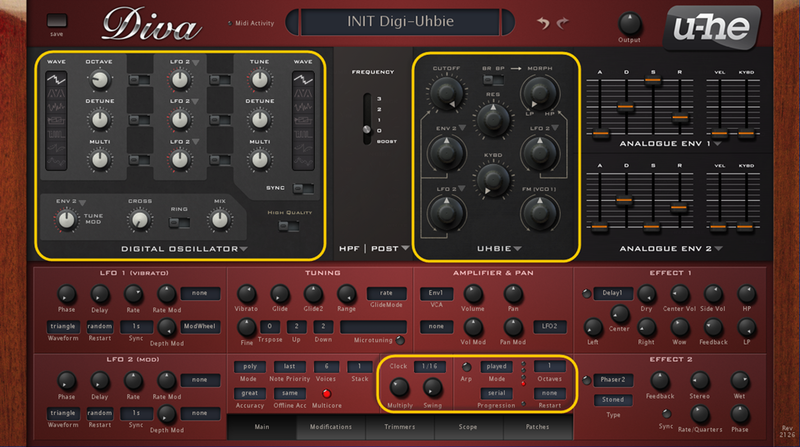 – Not to be mistaken with the recent crop of sequencers that also arpeggiate, this one pays tribute to good old analogue style arpeggiators, including some of the lesser known modes such as the "Leap" mode found in rare monophonic synths. 60 new factory presets using the new modules (They are also included in the installation zip file so you can save them to their own folder). AAX support for Pro Tools 10/11! To get this, just download from Diva's website. U-HE alludes to which synths they model. To save you time, I created a mindmap which offers an overview of DIVA’s anatomy plus tell you which synth module is used in which template. You can view the map here http://www.mindmeister.com/129725705/u-he-diva-synthesizer-osc-filter-anatomy.